We offer MSD (Marine Sanitation Device) installation, repair, and maintenance service and general marine plumbing services. Services include clearing clogs; marine toilet installation, maintenance, and repair; holding tank installation and maintenance; hose replacement. We have experience with most manual and electric heads (marine toilets), VacuFlush systems. 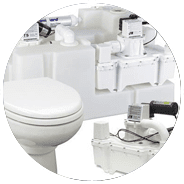 We are factory trained and certified by Dometic for sales and service of their sanitation systems, including VacuFlush, and carry most VacuFlush system components and parts in stock. To dispatch a highly trained and dedicated technician to your vessel’s berth on time and ready to take on any task. We are experts in sanitation systems and have state-of-the-art tools that will allow us to take on any job.